Stephen Raw has been commissioned by the British Academy to design a new medal. 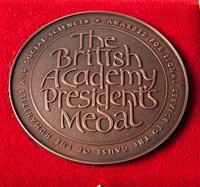 The British Academy President’s Medal, is awarded “for signal service to the cause of the humanities and social sciences”. The first three recipients of this prestigious award were Dr Sarah Tyacke (formerly CEO of the National Archives), language learning advocate Professor Michael Worton and political journalist Peter Riddell. The President’s Medal has taken four months to design and create, with the final drawings from Stephen Raw crafted into a 75mm bronzed metal medal produced by Spink Special Commissions Department. Up to five President’s Medals may be be awarded annually.